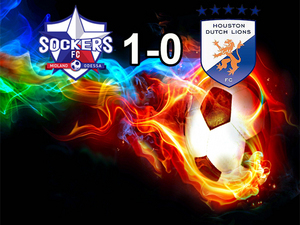 Sockers FC looking to keep up the good rhythm against Houston Dutch Lions FC. Sockers got a break in the beginning with an own goal by Antone Jarvis as he looked like he was trying to clear the ball for a corner. Following the own goal, Sockers kept up the momentum as they had a few shots on goal throughout the first half. As second half started, The Dutch Lions started to create some opportunities as they were able to capitialize on Sockers offisides. Sockers started to create momentum aroud the 70th minute mark as they had 3 chances on goal but Lions Goalkeeper Sullivan Lauderdale was able to make some incredible stops. Goalkeep Lee Howarth was able to hold things down in the 2nd half as he was able to help secure the 1-0 victory. Sockers will play their last divisional matchup against Houston Regals SCA. Gates open at 7pm; kickoff at 7:30pm. Following the game, there will be post game fireworks to celebrate Independence day.